From wedding music to funerals, from baptisms to celebrations, we sing the most ancient hymns and songs of the human condition. Sign up for our email list and we'll send you a free track of our most popular music! What does it mean to sing 1,000-year-old chants in the middle of New York City? In one of the trendiest, zippiest zip codes on the planet? Chant happens all around us; people from all cultures and faith traditions chant--in New York, you hear chant in yoga classes and taxi cabs, rock shows and churches. Our music is a statement about finding timelessness and universality, despite our specific time and place. 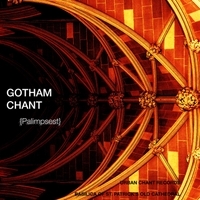 The Gotham Chant recording project is based on the chants we sing at the Basilica of St. Patrick's Old Cathedral. We call it Gotham Chant, alluding to our SoHo (downtown Manhattan) location; the moniker Gotham dates from 1807, shortly before the cornerstone of the Basilica was laid in 1809. Sit back, relax, and tune in to our timeless albums..
Chant your way to inner bliss. Amid the frenzy of New York City, our world-class Schola sings a kaleidoscope of medieval favorites from the Gregorian chant tradition. We recorded this Irish hymn for St. Patrick's Day. St. Patrick is the patron of the Basilica and of the Archdiocese of New York. The incomparable Patrick Connolly sings with power and beauty in the gorgeous acoustics of the Basilica. Timeless words of the prophet Jeremiah from the office of Tenebrae, set to Gregorian and Mozarabic chant, and framed by gorgeous Renaissance polyphony.